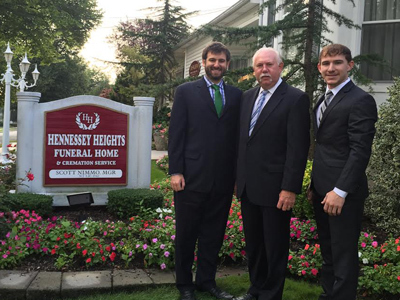 Founded in 1962 by Richard Nimmo, Bergen Funeral Service, Inc. is a family-owned and operated funeral home service. Scott Nimmo joined his father in 1980, while Scott’s son Andrew and his nephew Matthew Connors joined in 2012. Having grown up in the funeral service community, our family understands providing compassionate care and exceptional service to all families during this trying time. We have become a leader in all aspects of the industry with expertise in the funeral industry and international shipping. At Bergen Funeral Service, we understand the difficulty that comes with making decisions when a loved one has passed. Within the first 24-48 hours after a death, many decisions must be made within a moment’s notice. During this grieving period, no one should have to go through this process alone. Our professional and respectful funeral staff help guide you through the process to create funeral services in NJ, Brooklyn, Queens, and Florida that honor the life and memories left by a loved one. We will thoughtfully provide the information you need to make decisions that respect the wishes of the departed, your family, and your finances. If needed, travel arrangements (domestic or international) may also be arranged for the deceased and the family. We appreciate and have experience with the ceremonies and rites of many different religions, cultures, and traditions. Our funeral home has the capability to carry out your loved one’s final wishes, whether they include a large service, a small service, or none at all. When we speak with you to honor your loved one’s life, please inform us of any special accommodations that we must make to respect your family’s beliefs and wishes. Our advanced audio and visual capabilities create truly unique funeral services with remembrance programs that speak to beautiful memories and a love forever cherished. Musical arrangements can be made to provide attendees with comfort or to showcase music that your loved one found meaningful. Whether it is an immediate need or for pre-planning funeral services in NJ, Brooklyn, Queens, or Florida, we can assist you in coming to arrangements that work for you and your loved ones. We truly care about each individual who enters our doors and work tirelessly to relieve some of the stress endured during this difficult time. Traditional Service – Floral tributes are arranged and displayed at the funeral service. Collected memories including photographs, a video (if desired), and keepsakes will be presented to offer details from your loved one’s journey. Immediate Burial Service – A loved one is brought directly to a cemetery of your choosing for burial. The simplest and least expensive of all our options. Cremains Scattering – We assist you in creating a thoughtful ceremony that may include photographs, speeches, and multimedia. We will then scatter your loved one’s cremains freely at a dedicated, natural environment. Our professional funeral staff has helped our neighbors create truly meaningful funeral services in NJ, Brooklyn, Queens, and Florida. We are proud to serve our community with such delicate decisions. Our staff will help guide you through this difficult process with grace and dignity. If you have any questions or need immediate assistance, please don’t hesitate to call Bergen Funeral Service Inc. in NJ at (800) 262-7901. For contact information about our Brooklyn, Queens, and Florida locations, please see the contact information below.